The District has a mix of uses is populated by industry and business. It is home to the Glasgow Caledonian University Campus and Stow College (which will be redeveloped by Glasgow School of Art). The District also contains a significant number of residents. Some streets are dominated by vehicles which spoil the pedestrian experience particularly on Dobbies Loan and Cowcaddens Road. The pedestrian experience has been improved at Garscube Road with the installation of the Phoenix Flowers, It was re-designed to be a more attractive public space and to act as a gateway for pedestrians and cyclists moving between the city centre and the Speirs Locks area. The further expansion of the Speirs Locks area as a cultural District offers further opportunities. The District also contains Buchanan Street Bus Station which provides key public transport links around the UK. Cowcaddens subway is also located in this District. Similar to the Learning Quarter District, Cowcaddens is characterised by a high number of students and given its residential capacity there are opportunities to benefit from their footfall and spending power. This will be achieved by improving the overall pedestrian experience and making better connections with the city centre and the rest of the city. 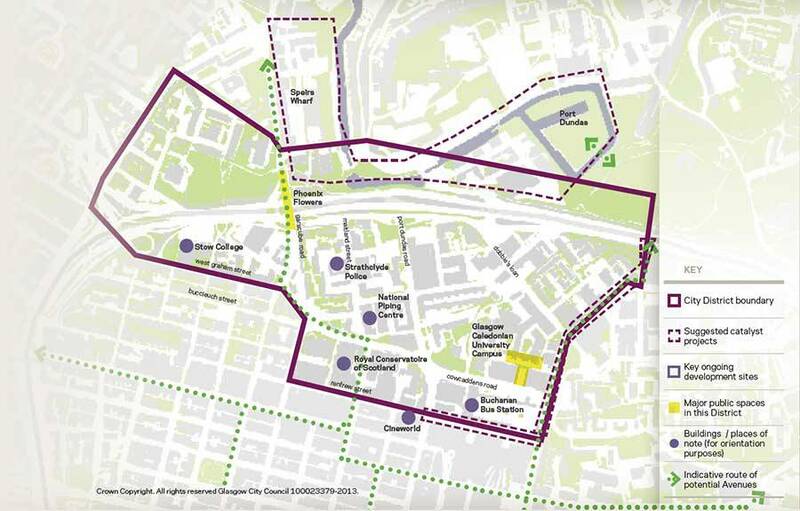 There is a project which could also help Cowcaddens connect to the rest of the city and that is the potential development of the Killermont Street to Sighthill landbridge connection.